John Logie was selected by President Gerald R. Ford as part of a committee from Warner, Norcross & Judd in Grand Rapids, MI. The law firm researched and reviewed court precedents that were provided to President Gerald R. Ford as legal standing in the decision to pardon Richard Nixon, before he was convicted. Logie also served for 12 years as Mayor of the City of Grand Rapids, Michigan. 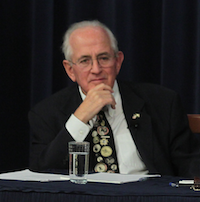 Logie participated in the Gerald R. Ford Presidential Foundation’s “President Ford and the Pardon of Richard Nixon” panel discussion at the Gerald R. Ford Presidential Museum on October 20, 2014. Ken Gormley: John Logie, you’re called into a meeting by Hal Sawyer, the head of your law firm, on a Friday, shortly after Ford becomes President, and given a confidential assignment. What is that? John Logie: Well, Hal Sawyer, most of you in the room know, was a wonderful trial lawyer, the best I ever saw and he was our chairman of the firm and he was a friend of Mr. (Phil) Buchen. But I have to interject, that this is the rest of the story to you from Grand Rapids. Phil Buchen was Jerry’s law partner. Before the war, he developed congenital polio, and moved around like Roosevelt did. So he, couldn’t go to war. But healthy Jerry Ford did. But they had a law firm together. When he came back, they worked together at the same firm until Jerry went to… see, I still call him Jerry because when he was a Congressman, I asked him what I should call him and he said “Jerry”. I didn’t do that when he was Mr. President. To shorten this down, we just kept moving it back and back because (Richard) Nixon at that point had never been accused officially of anything. Partly because he was President and partly because things were happening so fast. And Jill’s team was at work looking at the seeds at which way do we go on this and all that kind of stuff. But we worked our way back all of the way back to “What about if he hasn’t even been indicted or accused of a crime? Can the President, if he wishes to, step in and foreclose that ever proceeding?” And that was the front end of about a five step process, that I’ll just shorten so we can get moving back into this. That’s what we did. We got back together, on Sunday afternoon, each with our own research, talked our way through it, with a little bit more detail and checking and everything else. That’s when we became convinced that the President’s power in these kinds of situations is essentially unlimited. So our chairman, called Monday morning. Part of this you have to understand is that Phil Buchen was my godfather. This is Grand Rapids; we are all connected to each other. And moreover, my Dad had one sister, only one of four kids and she married a guy named Bill Bloomer who is Betty’s older brother, so we became family. I just said “hi cousin” to Steve (Ford). But, not really but you get the point. There were these other layers of the connection, and it was wonderful when we could get Jerry to come back here, which I did as Mayor, more than once and things like that. Phil filled in a lot of these blanks on how and why they did things. Gormley: We just heard from Jill (Wine-Banks) that she’s really changed her views somewhat over the years. But what was your view of the pardon when you conducted that secret research in 1974? And is it the same today? Logie: Fair enough, but I want to begin with another missing piece that hasn’t come out, to this audience particularly. My godfather and his wife Bunny, were long time members of the liberal non-denominational church, Fountain Street Church. Some of the people in this room and in Grand Rapids don’t even think it’s a church. But, that’s Fountain Street Church and Suzy and I have been members for 45 years and he had written the history of that church. At some point, Ford was wavering go / no-go on the pardon just between him and my Uncle Phil which was his White House Counsel. Well, Phil called Duncan Littlefair and said “Can you get down here quietly and we’ll pick you up? I want you to talk to with the President before he makes this decision.” All of that came true. In the dark of night. There was no record much kept of it except I talked to both Duncan after the fact and the President after one of his visits here years later. Duncan was absolutely, solidly behind the pardon. He had some of the reasons that actually were used. He wasn’t the only one saying it, but he was saying it. He came back in suitable time and actually preached a sermon on it. I was still mad about the whole damn thing. I thought he should have gone to jail with you (agreeing with Jill Wine-Banks on a Richard Nixon trial). But that was me forty years ago. I think Ford was absolutely right and he told me in one of his visits here, when I was mayor and we got together. He had been president for you know, days or weeks. He’d never run but he knew if he did, it would probably decide the outcome, and I had talked to him after the fact, way after. And I’ve got to tell you something else. Some of you will remember a tailor here called Lloyd Levenson. Lloyd made suits from scratch for professional businessmen, lawyers, doctors and other people like that. Ford was in Congress for 25 years. With that dirty background, they were searching for somebody that they weren’t going to get bombed on in his experience. Jerry had been there for 25 years. They came in with an examination. So, they found out that Lloyd was making his suits, and they went to see Lloyd, and they said, “We understand that you make suits for Vice President to-be (Gerald) Ford, and you keep records. Who’s paying for them?” He said (Lloyd), “Yeah, I can get that out…” That’s how thorough. I mean, I’ve got one of my partners, one of my age-group in here and I would not have liked to withstand that kind of a search. But, he was so clean and so wholesome and so Grand Rapids, that it’s just amazing. The second thing is, we got paid. Guy Vander Jagt had been an associate at Warner Norcross in the 60’s. He went on and went to Congress, stayed friends with all of us. He was detailed after all of this time, with a job, to come home and to take all of this that had worked on this project to dinner to the now debunked Peninsular Club. Because I had heard Lloyd’s story by that time and the story was, that (Gerald) Ford paid for it, our dinner, with a personal check. That was our pay.